. 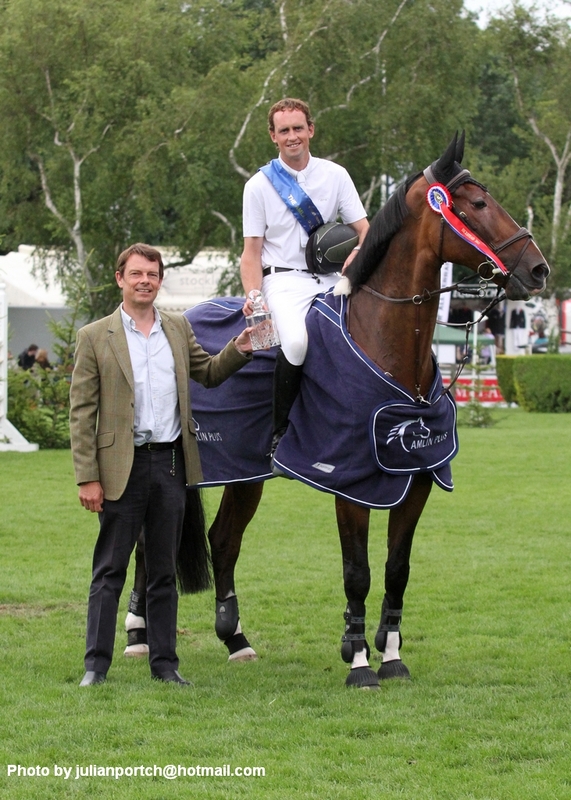 :: TREVOR BREEN RISES TO THE CHALLENGE IN THE AMLIN PLUS EVENTING GRAND PRIX ::. The Amlin Plus Eventing Grand Prix ended in thrilling fashion today, with the win going to Irish showjumper Trevor Breen. He just pipped Olympic event rider Andrew Nicholson to the title, with Grand National-winning jockey Robbie Power in third. Trevor Breen, who was riding Adventure De Kannan, says: "Two years ago I was third because I went too quick, so I thought if I could keep clear, it would put the pressure on the others and I think it worked out,” he said. Trevor and Adventure De Kannan won the 2009 Bunn Leisure Speed Derby at Hickstead, and having picked up the Amlin Plus Eventing Grand Prix today, Trevor is now keen to make it a hat-trick of international wins here. “When he won the Speed Derby here, I said I would win the Carpetright Derby on him - it may be taking me longer than I hoped, but we’ll just have to do it next year,” he commented. New Zealand eventer Andrew Nicholson got out of an Olympic training camp early to compete in the Amlin Plus Eventing Grand Prix, and he finished second on Quimbo. "It was superb to jump in this class, and good preparation for the Olympics," he said. Robbie Power, who won the Grand National in 2007, came third on his first time ever attempt at the Eventing Grand Prix, riding his sister Elizabeth’s Doonaveeragh O One. "It was grand in there but I felt a bit lonely because usually in a race there are a few more around me,” he said. “My sister competed on the horse last year and I’ve done better than she did, so I think I should get to keep him for next year." Not to be outdone, Trevor’s older brother Shane won the first international class of the week, The Royal International Vase, on board Ominerale Courcelle. Show producer Katie Jerram and the prolific gelding Dunbeacon won the Leeman Family Supreme Hunter Championship today, one of the most coveted titles in showing. *Photo of Trevor Breen and David Ashby by Julian Portch.